All our emails are formed firstname.lastname@yle.fi. Here you can find the contact information of the rest of the Yle's editorial offices around Finland. Get to know Yle's organisation, management, and responsible editors here. Get to know the members of Yle's Board of Directors and their tasks. Get to know the members of Yle's Administrative Council and their tasks. Our technical consultation helps with the technical questions related to Yle's services. 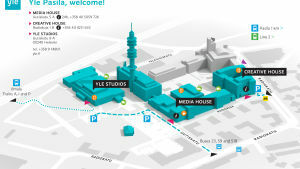 Ask about Yle Areena service. More about Yle Archive Sales. The Finnish Radio Symphony Orchestra (FRSO) is the orchestra of the Finnish Broadcasting Company, Yle. Its mission is to produce and promote Finnish musical culture. Read more about FRSO at their website.